At DEFCON 20, Raphael Mudge the developer of Armitage released the most significant update to Armitage. Armitage is now fully scriptable and capable of hosting bots in acollaborative hacking engagement. Raphael Mudge is the founder of Strategic Cyber LLC, a Washington, DC based company that creates software for red teams. He created Armitage for Metasploit, the Sleep programming language, and the IRC client jIRCii. Previously, Raphael worked as a security researcher for the US Air Force, a penetration tester, and he even invented a grammar checker that was sold to Automattic. Raphael talk about Cortana scripting language for Cobalt Strike and Armitage. 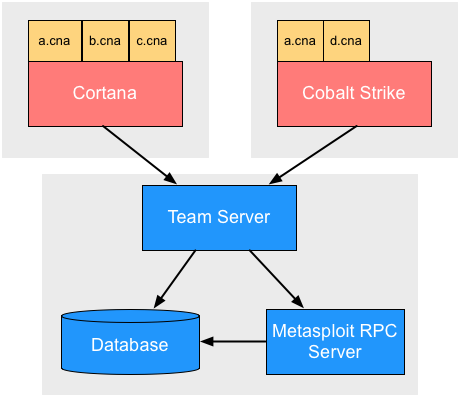 Cortana allows you to write scripts that automate red team tasks and extend Armitage and Cobalt Strike with new features. This technology was funded byDARPA's Cyber Fast Track program and it's now open source. Armitage a red team collaboration tool built on the Metasploit Framework. Cobalt Strike is Armitage’s commercial big brother. Both packages include a team server. Through this team server, multiple hackers may control compromised hosts and launch attacks through one instance of the Metasploit Framework. Using Cortana, you may develop stand-alone bots that join your red team. Cortana bots scan hosts, launch exploits, and work on compromised hosts without stepping on each other or getting in the way of their human teammates. Cortana scripts may also extend the Armitage and Cobalt Strike clients with new features. Cortana scripts can expose hidden Metasploit features, integrate third-party tools and agents, or control other Cortana bots.